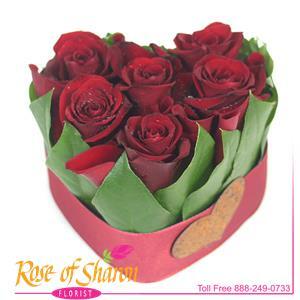 Six velvet roses arranged as a Valentine Heart. Finished with a border of lemon leaf and a satin ribbon. Adorned with a rusty, metal heart. Each heart is delivered in a red gift box, finished a second "found heart" and a satin bow. Lots of detail in a petite presentation.